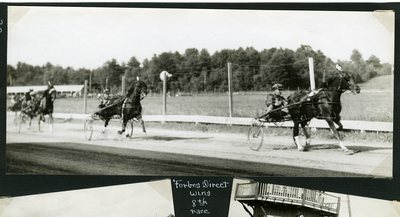 Black and white action photograph of bay gelding, pacer Forbes Direct, Jordan up, leading the field toward the finish line in the eights race of the Saturday, July 6, 1940 race event at Narragansett Park on the Gorham Fair Grounds. Forbes Direct finished the race in a time of 2.08. Brown stallion The Law, Utton up, placed in second while bay gelding, Prince Adam, another horse owned by Avis Gross of Auburn, Hall up, showed with a third place finish.